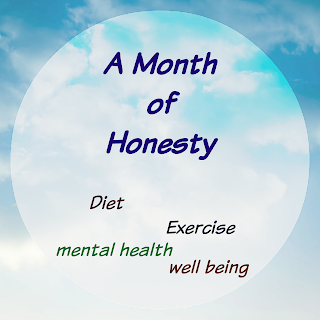 Ojo's World: The Month of Honesty: The round up! The Month of Honesty: The round up! So, the month of honesty is over. I have written every night, throughout October, logging my mood, well being, diet and exercise. It's been like therapy for me, if I'm honest. It's made me realise it's not all about the scales, it's about feeling good. I've gone through everything with you. I've had ups and downs, I've had the flu, I've had moments of utter joy and days of complete anxiety. You have been with me through it all. I've had some wonderful advice, and brilliant support. Now it's time to tie it all up with a neat little bow. I genuinely struggle with weight loss, I only really remember being slim twice in my life. Once when I was in my mid teens, and once when I was trying to get pregnant the first time. Even then, I wasn't 'thin', but then I never wanted to be. I like being shapely, but I want to be fit too. Fitness is being achieved, I think. I had a wonderful chat with my Zumba instructor, which really motivated me. I've missed more this month than normal. I missed a week, sulking, because I hadn't lost what I hoped (that will never happen again!). I missed another week because of the crappy flu that's doing the rounds. I thought that would really knock the inch loss, and was not hugely hopeful. I am OVER THE MOON! I really wasn't expecting that, especially as it's that time of the month where my stomach bloats. I said I would take any small change, personally I think that's a HUGE change! The other chat I had this month, was with the lovely lady behind Thinking Slimmer (do take a look). She is as baffled as me, by my lack of loss. She has come up with a plan to try stopping Carbohydrate intake, after 4pm. I thought this would be hard, but actually it's not. Making sure I have plenty of fruit, frozen vegetables and protein in the house has been helpful. 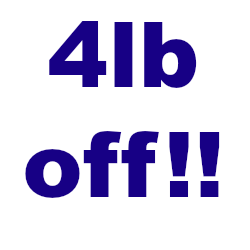 My scales have not moved significantly, in a few years, this amount of weight loss in unheard of! I really do put this down to a altering my days eating pattern. I now have my main meal earlier in the day, then focus on fruit, veg and protein for tea. I have learnt that, in regards to my mental health, I can cope with a lot more than I think. That getting out of the house significantly raises my mood, and that Zumba gives me an 'out' that is much needed. I think my general health is improving. Partly thanks to medication, a lot thanks to exercise. So that's it. My month rounded up in a nutshell. I will keep posting about these things, because it helps me to write it out. Hopefully, if you're struggling, it will help you too. I'm so proud of myself for doing this, and for seeing a difference. I had a couple of suggestions through the month that I've taken on board, especially the lack of fruit in my diet. I'm making a considered effort to change that. On to next month, one of my friends noticed my 'flights of stairs' were low, on my fitbit pictures. She has challenged me to be on 10 flights of stairs, every day, by the end of the month. I've accepted the challenge, and shall let you know how I get on!